New project is new! 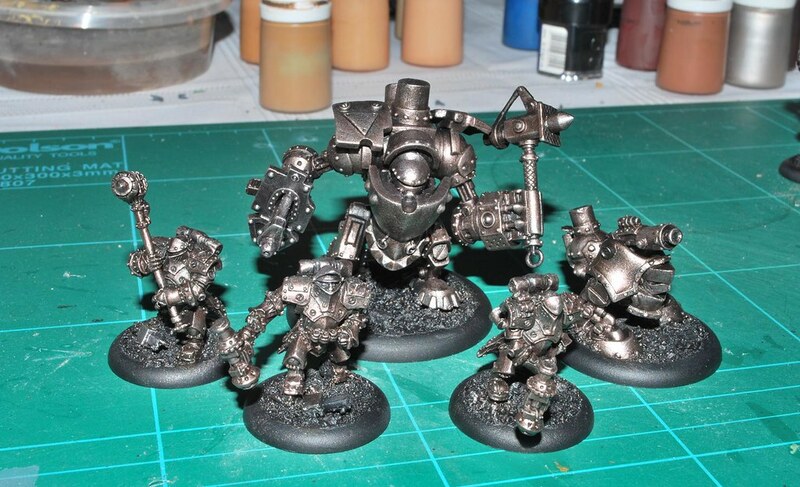 This week I will be mostly painting...Warmachine. 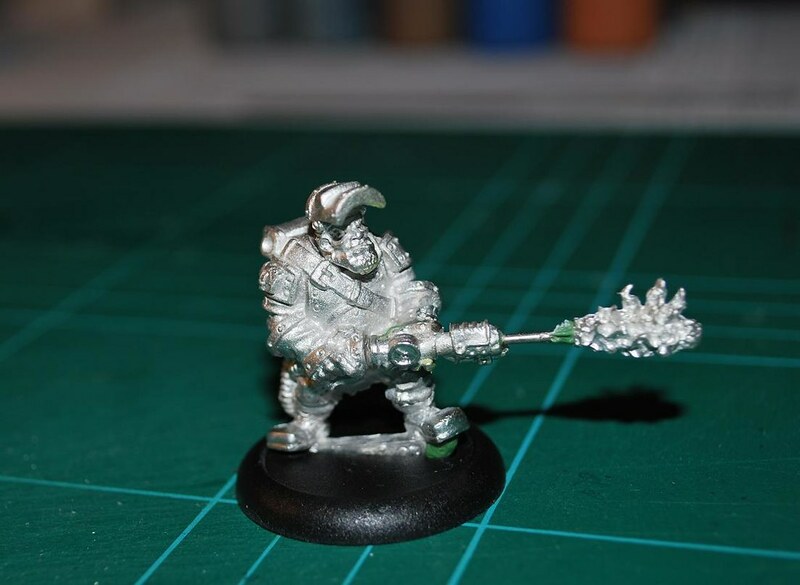 In fact I nifty little Rhulic Dwarf army. 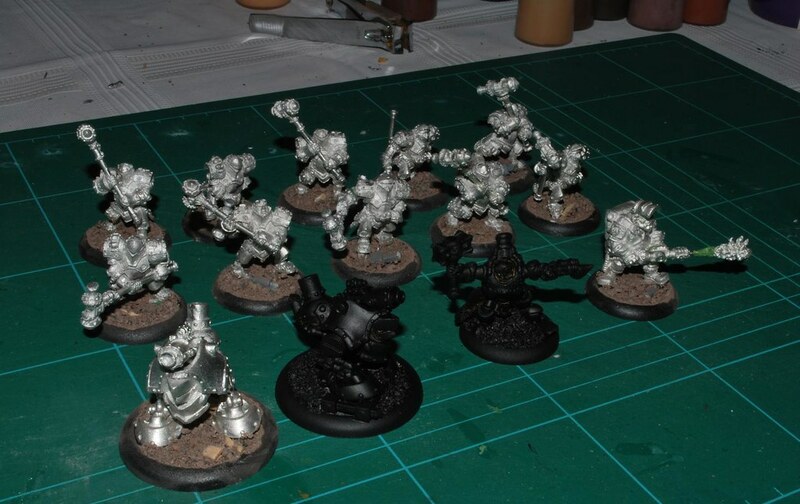 To be honest this is the first time I have ever worked with Warmachine or any Privateer press models. I have had my eye on a lot of the Warmachine models for a while, so this was a great opportunity to see, build, and paint some. I find out that, much like Dr Pepper, I like them! So what do we have, Gorten Grundback leading; a hefty number of Horgenhold Forge Guard, Thor Steinhammer, with 2 Grundback Gunners and 2 Wroughthammer Rockram jacks in support. Here they are, I fun pile of models to get your grubby mits on, together with the usual pile of tools we're good to go. Equipped with, clippers, super glue, green stuff, pin drill, files, sculpting tool, and large steel paper clips (for pinning). 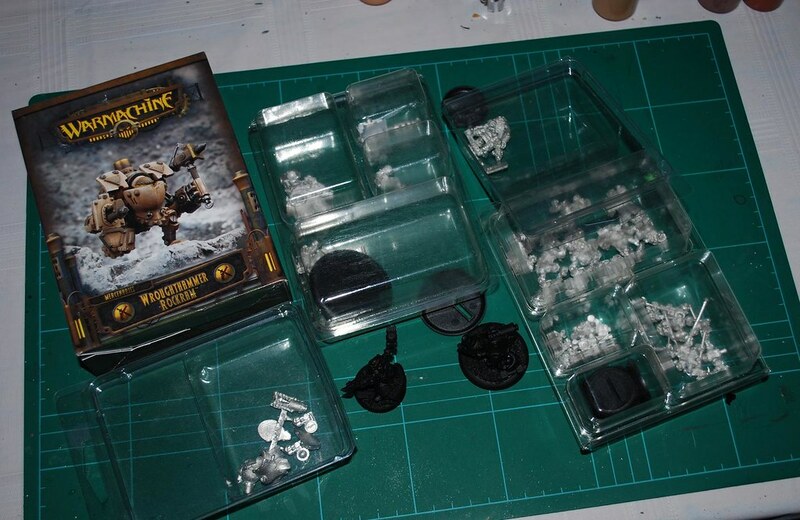 Thumbs up for Privateer Press, I found all the components had very clean and well mounded joints and connections. Most were together in a flash with the appropriate use of super glue (I have seen a lot of failed super glue attempts in my time, remember less is definitely more). WARJACKS, these big guys also go together pretty smoothly. I started by pinning most of the first so I could adjust its pose enough to make it stand out from its twin in the army. 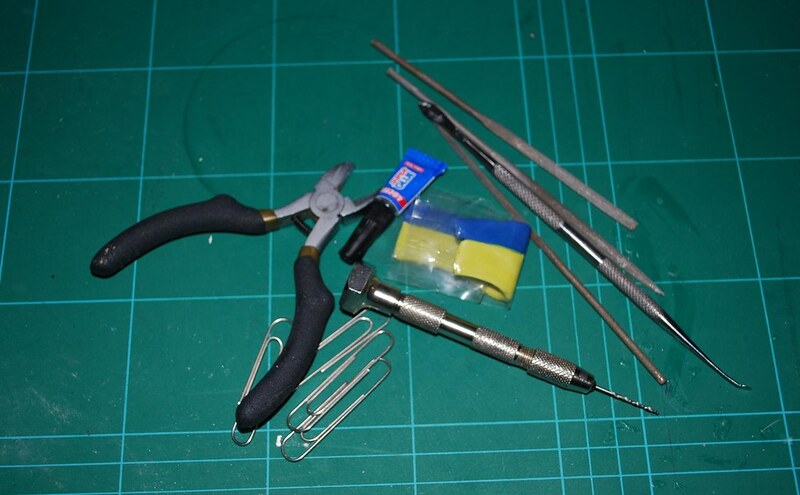 The biggest tip I learnt from building these was to pin, glue and let set the legs to the body first! 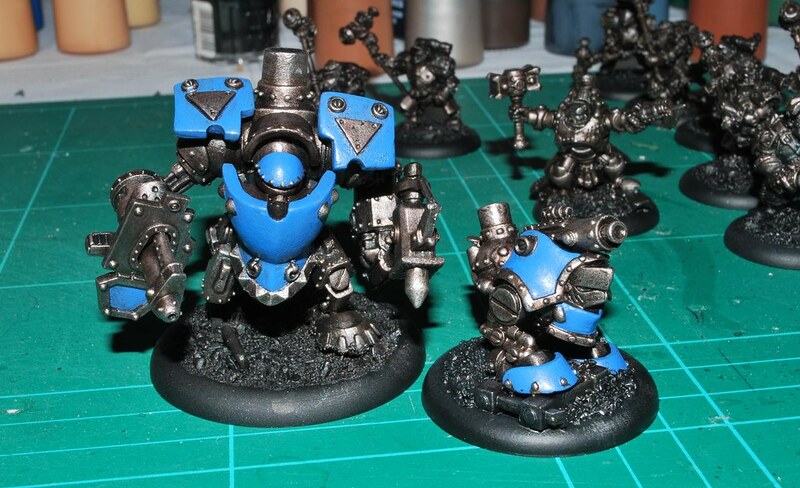 Warjacks have a huge amount of top heavy weight and in the case of the running pose all this pressure is applied to the single small hip joint. Having this joint set beforehand lets you stand on pose the model at your leisure. Okay, here we are with the infantry and Gunners complete. A couple of the Forge Guard had subtle arm repositioning to add enough variety in the overall look. Also note the repining of the flame effect on Thor Steinhammer. This gave it structural integrity and aloud me to lengthen the flame just a touch. Wip below. For now I will leave you with a couple of the intial painting pics. For the metals and the base blue coat for the selected panels. This may give you a hint to the intended theme, but with only scruffy base colors, plenty more work to do.